Kevin Egnatuk was born May 30, 1963 in Lansing, Michigan to Tony and Virginia Egnatuk. Tony was an administrator in the East Lansing school district for over 30 years before retiring, serving the majority of his tenure as Principal of Hannah Middle School. Ginny spent many years working at MSU in the controller’s office. Kevin credits his success both on and off the field to the examples set, and the work ethic displayed, by his parents while growing up in the East Lansing community. Kevin earned varsity letters in three sports while attending East Lansing High School. He lettered in Football, Basketball and Baseball his senior year, after having to sit out his entire junior year with a back condition requiring him to wear a full body brace. In football, Kevin earned All-Conference and All-State team honors as well as being named to the Detroit Free Press “Dream Team”. At the end of his senior year, he was selected to play in the 1st annual, East – West All-Star game played at Michigan State University. Kevin credits ELHS varsity coaches Jeff Smith (Football) and Herb Gibbs (Basketball) as role models who had a significant impact on his life. Upon graduation from ELHS, Kevin attended Central Michigan University as a “walk-on” athlete. After his freshman year in Mt. Pleasant, he earned a full-ride scholarship and played football for the Chippewas for four years. 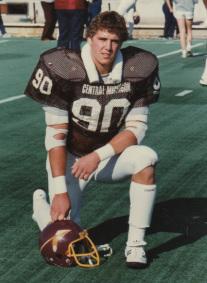 Following the 1983 season, Kevin was named 1st Team All-Mid American Conference as an outside linebacker. Additionally, while attending CMU, Kevin was selected to the Academic All-American Team. Until recently, he held the CMU record for most tackles for a loss in a single season with 23. Kevin had the fortune of playing for legendary College Football Hall of Fame Coach Herb Deromedi while at CMU. Having completed his college education with a degree in finance, he began his business career working for The Delfield Company, an equipment fabricator serving the food service industry. While working at Delfield, he met his first business partner whom he later bought out in 1999, when he along with his current partners formed Northwind Investments. Today, Northwind Investments continues to grow, currently owning and operating 24 Burger King restaurants, 10 Qdoba Mexican Grill restaurants and 1 Marathon Gas station / Travel Center along with other various real estate investments. In 2005, Kevin was honored by the Michigan Chapter of the National Football Foundation College Hall of Fame and the Detroit Free Press with the “Hal Schram Award”, given annually to a former Free Press Dream Team player for his significant career accomplishments and willingness to give back to his community. However, the accomplishments he is most proud of are those of his three children, Ryan (23), Brett (20), and Kyleigh (17). Both of his boys were named 1st Team All-State linebackers while playing football for Rockford High School in Grand Rapids, Michigan. In addition to both boys winning a Division 1 State Championship while at Rockford, both Ryan and Brett were also selected to play in the annual East–West All-Star football game, making history, as the first father/son duo’s to compete in that game. Kevin’s daughter, Kyleigh, a junior in high school, plays both basketball and lacrosse. She has played varsity lacrosse since her freshman year in High School and the Rams from Rockford are poised to make yet another run at a State Championship this spring. Kevin spent many years coaching youth football and basketball while his kids were growing up. Kevin and his wife of 25 years, Donna (DeFrain) Egnatuk (ELHS class of 1982), live in Rockford, Michigan and are very active in their community. He also serves on the Burger King Great Lakes Franchisee Association’s Board of Directors.